The inventor of the American suburban shopping mall was a socialist. Could his creation have been saved? 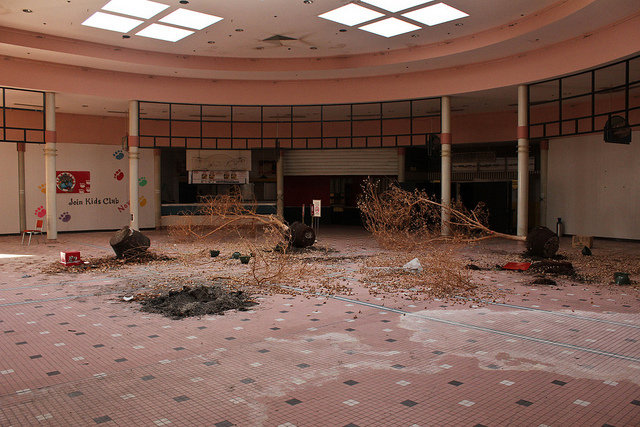 The American landscape is littered with hundreds of dead shopping malls. 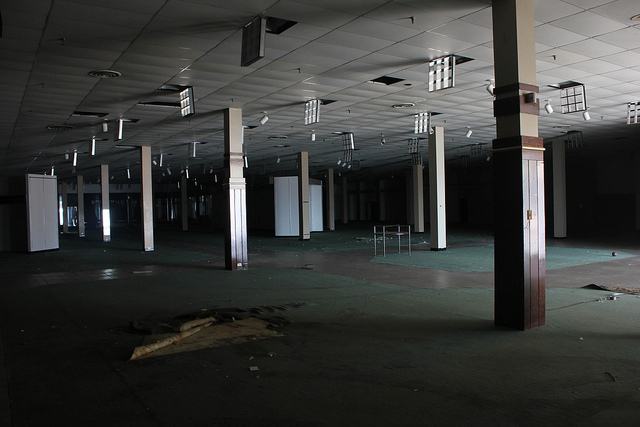 In places like the vast Rolling Acres Mall in Akron, Ohio, which has stood empty since 2008, the indoor fountains have stopped running, but the prosthetic plants inside remain eerily green. 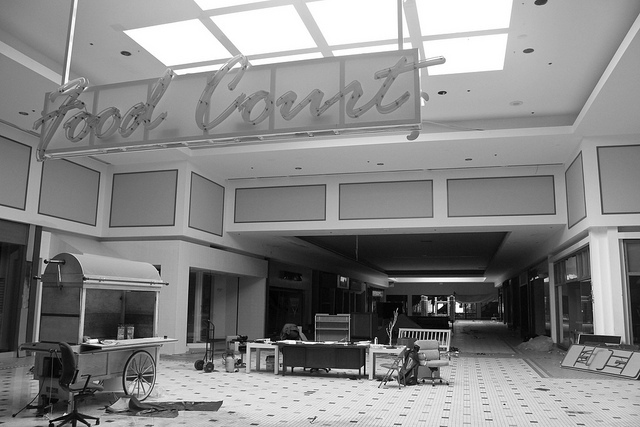 More will join them — 15 percent of American malls will close in the next ten years. 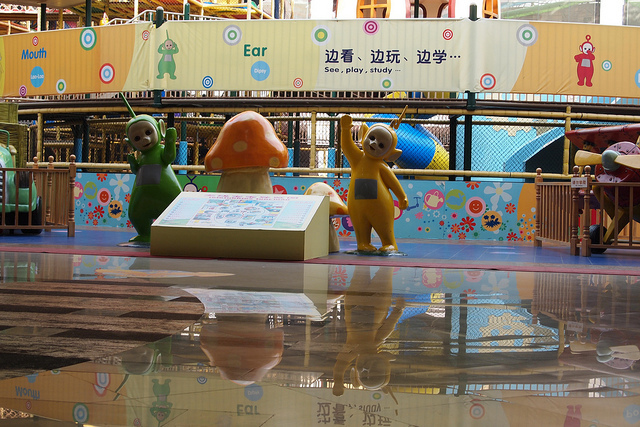 The biggest shopping mall in the world, the New South China Mall in Dongguan, is also a dead mall. Opening in 2005, it boasted seven zones, each based on major international cities and featuring including a replica Arc de Triomphe and a Venetian canal complete with gondolas. 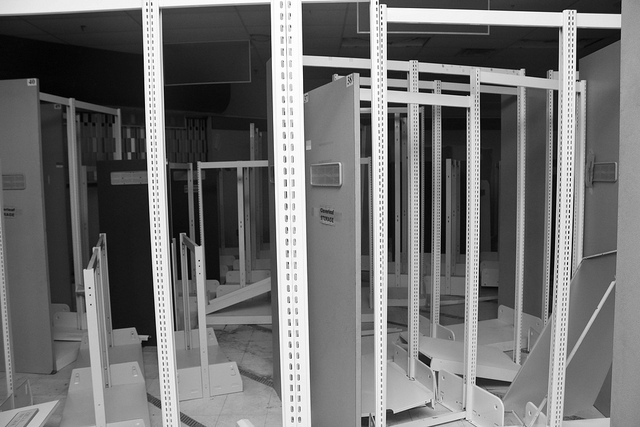 However, the mall has remained 99 percent vacant since its opening. Aside from a cluster of fast food restaurants near its entrance, it’s nothing more than a network of vast atria, mothballed cinemas and roller coasters. When archaeologists of the distant future dig through the vast ruins of these peculiar structures, they would be hard-pressed to find more fitting physical manifestations of our late twentieth-century condition. The global rise of the shopping mall in this sixty-year period has led to the greatest standardization of space that has ever occurred in human history. In the era of the mall, whole swathes of the world are heated to precisely seventy-two degrees Fahrenheit and lit at 350 lux. Shopping malls have been used as tools for development in India, sites of protest in Brazil, and targets of terrorism in Nairobi. For geographers and historians, the sites have been seen as neoliberalism’s most precocious architectural form, instruments for enclosing and segregating public space, for fusing leisure and consumption and annihilating small independently run retailers. It was not always this way. 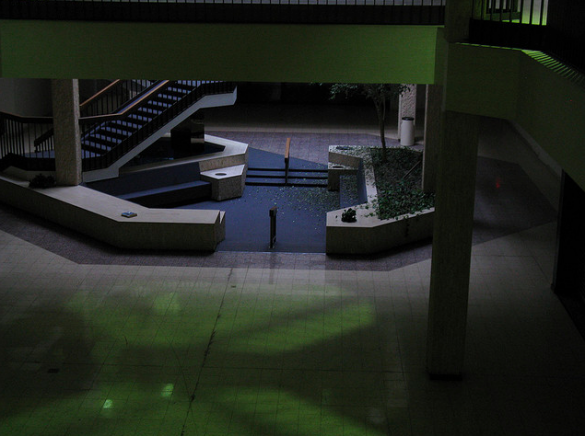 Shopping malls have a little known socialist pre-history — one that has been largely forgotten. The inventor of the American suburban shopping mall, Victor Gruen, was a Viennese architect and socialist forced to flee to the United States after the occupation of Austria in 1938. 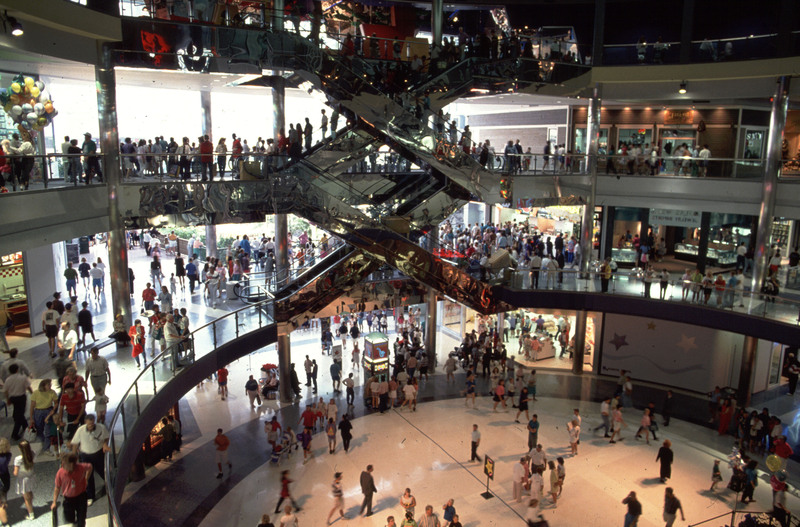 Gruen saw the mall as having the potential to re-centralize suburban sprawl. His plans were for large state-owned indoor agoras that would literally contain the market forces that were running rampant outside their walls. It was a modernist vision for the refounding of American public life. Many of the malls built by Gruen and his company in the 1950s retained elements of this promise, with his Southdale Mall in Edina, Minn., planned around an enormous common meeting place modeled on a European piazza. By the 1960s, Gruen was horrified by his creations. The shopping mall, along with the freeway and the cheap federally backed mortgage, had become part of the architecture of suburban white supremacy. Gruen returned to Austria in 1968 and furiously worked on a project to pedestrianize Vienna. It took the intervention of the Luftwaffe for something like this vision to be realized in Britain. Coventry, a small city in the Midlands of England, is an unlikely site for what might arguably be the first shopping mall-like structure in the world. The total destruction of the city during the war wiped out the dense, packed medieval shopping streets that had characterized its pre–World War II history. With the help of the British government, the city’s head architect Donald Gibson was able to use new emergency legislation to effectively nationalize the center of Coventry, bringing almost 500 acres of land under the total power of the local authority. There, he built a holistically planned, partly enclosed multi-story shopping center — arguably the first of its kind in the world. While the city owned the land, provided the frame, the concrete steps, the bridges, the car parks, and the greenery, the tenants provided the temperature control, the music, and the lighting. The doors were never locked. The socialist pre-history of the shopping mall belongs to a political moment that has long since passed. But there is no reason to believe that the creation of abstract, regulated spaces of consumption should advance rather than hinder the progression of free market forces. That the shopping mall mutated into one of the most noticeable landmarks of the private twentieth-century city was not to be foreseen in the 1940s and early 1950s. This alternative history of state-sponsored consumption, of massification without privatization, disturbs some of the most basic political dichotomies of our recent age. At a time when political lines are being drawn between the organic deli and the suburban supermarket complex, the early malls of Donald Gibson and Victor Gruen were simultaneously neither, and both. Today’s shopping malls are worlds in themselves, removed in both time and space from the chance play and chaotic bustle of the high street. They are carnivals of artificiality where time and space are collapsed under the eternal sun of fluorescent lights. The West Edmonton Mall in Alberta, Canada, has a Chinatown, a Bourbon Street, and a replica of the Santa Maria. While, in the early twentieth century, live bands would accompany shoppers in department stores, shopping malls perfected the standardization of background music. Most “muzak” has historically consisted of orchestral arrangements of well-known songs (the Slovenian State Orchestra playing “Satisfaction” by the Rolling Stones) played at barely audible volumes. Generally the music is played by stringed instruments with little voice or percussion — a cocktail guaranteed by marketing psychologists to induce consumptive torpors. Usually the music is provided by a mall’s “facilities manager,” the point person responsible for the efficient distribution of heating, lighting, and electricity, and becomes almost part of the architecture of the mall itself. Meanwhile, the aggressive, unquestioned privatization of such spaces has led to the expulsion of the homeless and the banning of public demonstrations. After a series of Supreme Court rulings in the 1970s and 1980s following political protests in shopping malls, First Amendment rights are not applicable within shopping malls. The aggressive standardization and privatization of global shopping spaces would have devastated the early socialist pioneers of mall-building. The vast, almost imperial Mall of America in Minnesota, once the largest shopping mall in the world, is only a ten-minute drive from Victor Gruen’s first creation in Edina, Minn., but it is separated by a massive historical rupture. As a child growing up in British suburbia, the mall became a central part of my life. Many children first visit Santa in the giant indoor “town square” opposite a supermarket, or get their first job in one of the stores. I had my first kiss outside “the tree,” a giant oak which stretches up out of a circular skylight in the mall’s roof. Indeed, some of my first experiences of political protest were with the local anti-Iraq war coalition, which, banned from the shopping center, was forced to protest outside the often-deserted railway station. The decline of shopping malls in the wake of online shopping has sparked a sadness in some commentators at the loss of this social world. In the 1960s, people reacted to the destruction of British high streets and American downtowns at the hands of shopping malls with similar pangs of sadness and nostalgia. Who could have predicted that these malls would then fall prey to an even more isolating form of privatization?